I meet Lance on the beach at 5am, my first day in Hawaii. I’m stupid jetlagged and am absolutely convinced it’s 9 in the morning and my dormmates are just sleeping late. My watch is still on British time so I head to the beach, because what else are you supposed to do when you’re awake and in Hawaii? Lance is the only person there who isn’t running or surfing. I ask him for the time and he tells me, then a few minutes later comes back and gives me a watch with a broken strap he’s found in the sand. We get talking and then somehow I’m on the way to a supermarket in his car. The supermarket is closed so we go and get breakfast. A Hawaiian breakfast, he says, and I nod, hoping pineapple will somehow be involved. 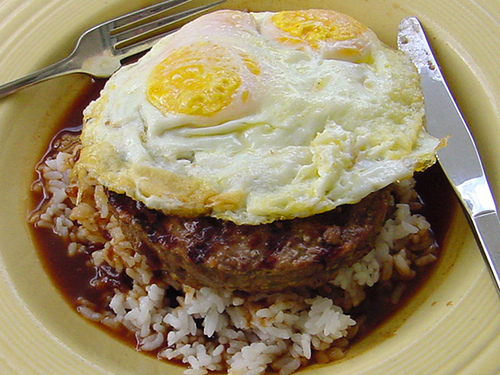 I end up with Loco Moco, a Philippian/Hawaiian hybrid dish of white rice, a burger patty and a fried egg all piled on top of each other then smothered in brown gravy. Basically, the last thing in the world I would ever have ordered if I’d ever been eating breakfast off my own bat. As you’ve probably guessed, it was fantastic! Filling and comforting and strangely familiar, a mishmash of ingredients I’d tasted before but never in that combination. Yummy, carby, eggy goodness. After we’ve eaten we drive back to the supermarket (open now it’s not stupid o’clock in the morning) and I get in some basic food items. We exchange numbers and Lance drops me back at my hostel. He’s the first person (apart from the front desk guy) that I meet in Hawaii. 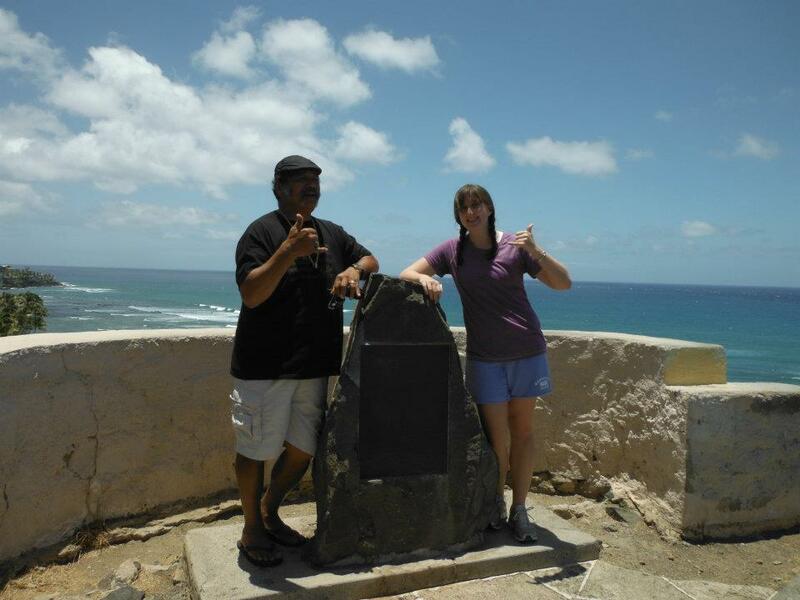 I end up staying on Oahu for three months, working as a receptionist. I see Lance roughly once a week and he is an invaluable resource. Not only does he drive me to the shop which is a pain to get to by bus, but he tells me so much about the island. I learn how Oahu is divided right down the middle by a mountain range, splitting it into the windward side and the leeward side and how you can watch the clouds rolling in from the leeward side only to see them stop right at the mountains, as if there’s some kind of force-field there. I learn how to tell when a papaya is ripe and how to eat a lychee. I learn what pidgin is and that flip-flops are called slippers and pancakes are griddle cakes. I learn how to bodyboard (kind of). I learn about his sons and his wife and how his brother is the best at roasting the pig for family gatherings. He gives me a Rash Guard once I start surfing and recommends eating at his buddy’s restaurant which turns out to be the best meal I have on the island. My friendship with Lance is exactly what I needed to counteract the tourist craziness that is Waikiki. He became a link to the ‘real’ Hawaii where people have jobs and lives and bills and cancers and disappointments, the island of the Kama’āina (locals). He is the Hawaii I would likely never have known about, working my receptionist job on Waikiki’s main strip. He added so much to my Hawaiian experience, made it so much more that it could have been and I often find myself thinking back to his kindness. It meant a lot to me at the time but perhaps has grown to mean even more to me with the power of hindsight. I won’t talk too much about this now as I’m planning to do a separate blog post on it but my time in Hawaii was a bit of a mixed bag. There were really great times and experiences, then other times when I felt very unsure and alone. Lance’s friendship was so pure, so without motive or expectations; it was just a little beacon of comfort in a choppy time in my life.